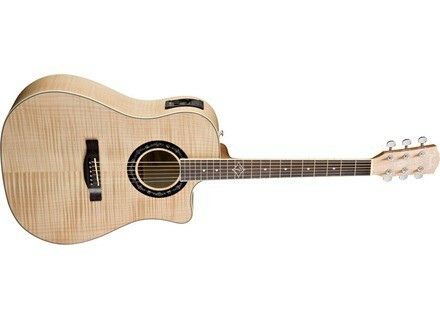 T-Bucket 400CE [2010-2012], Acoustic-electric Folk/Western guitar from Fender in the T-Bucket series. Product replaced by the Fender T-Bucket 400CE [2016-Current]. Fender announced its move to Fishman preamps with built-in tuners for all acoustic guitars with onboard electronics, and the release of two new acoustic guitars, including the T-Bucket 400CE acoustic guitar. Fender has now upgraded all of its acoustic guitar preamp systems to Fishman. Among these instruments, the Sonoran SCE models now have preamps with built-in tuners thanks to their new Fender Fishman Isys III systems. The new Hot Rod Design series T-Bucket 400CE features a natural finish flame maple top, back and sides. A closer look reveals an inlaid Fender “F” and pinstriping motif at the 12th fret, designed by graphic artist and rockabilly musician Vince Ray. Fender fans will note that Ray was the creative force behind the 2008 “Unlucky 13” limited edition acoustic guitar model. The T-Bucket 400CE also features an inlaid pinstriping motif on the headstock and rosette, and ivory neck and body binding. Structurally, the guitar features scalloped X bracing, a dual-action truss rod, all-solid rosewood bridge with compensated saddle, side dot position inlays, factory-mounted forward strap button with internal block reinforcement, chrome end pin, white bridge pins with black dots, and a Fender Fishman Isys III preamp with built-in tuner. Fender Dirty Donny Franken-Bucket Fender proudly announces its move to Fishman preamps with built-in tuners for all acoustic guitars with onboard electronics, and the release of two new acoustic guitars, including the “Dirty Donny Franken-Bucket”. Fender Pro Tube Super-Sonic 60 Combo The new and updated 1x12” Super-Sonic 60 Combo offers the same features as the Super-Sonic 22 Combo, but kicks the power up to 60 watts and is fine-tuned for increased bass response and fatter tone, Fender says. Fender Pro Tube Super-Sonic 22 Combo Fender unveils the next generation of its Pro Tube series Super-Sonic guitar amplifier family with the introduction of the Super-Sonic 22 Combo.